Six-year-old Bradley Lowery, whose plight touched the lives of many people, has died after a long illness. The Sunderland fan was diagnosed with neuroblastoma - a rare type of cancer - when he was 18 months old. 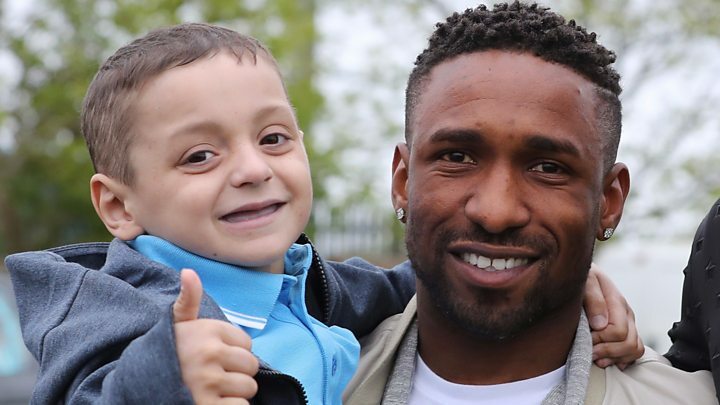 Bradley went on to be the club's mascot and became "best mates" with his hero, striker Jermain Defoe. A minute's applause for the youngster took place just before the kick-off in the club's friendly against Bury at Gigg Lane. Read more here about tributes and reaction to Bradley's death. Bury's chairman also said all gate receipts from the match will go to Bradley's fundraising campaign. His death was confirmed on social media by his parents. The posting read: "My brave boy has went with the angels today. "He was our little superhero and put the biggest fight up but he was needed else where. There are no words to describe how heart broken we are." Image caption Bradley's mum Gemma Lowery had previously said his deterioration had been "heartbreaking"
In a statement Sunderland FC extended its "'love and support" to Bradley's family. It said: "He had a special relationship with Jermain Defoe and their feelings for each other were evident for all to see. Jermain, naturally, is heartbroken." Bradley underwent treatment and was in remission, but relapsed last year. Well-wishers raised more than £700,000 in 2016 to pay for him to be given antibody treatment in New York, but medics then found his cancer had grown and his family was informed his illness was terminal. In December, Bradley's parents Gemma and Carl, from Blackhall Colliery, County Durham, were told he only had "months to live". Four months later they were told the latest and final round of his treatment had failed. He underwent "tumour-shrinking treatment" at Newcastle's Royal Victoria Infirmary but the cancer continued to spread. On 24 May, Mrs Lowery said Bradley had left hospital to start palliative care at home, adding more tumours had been found and further radiotherapy was planned. Then, on 28 June the family wrote on Facebook: "Bradley is deteriorating fast, his temperature is going very high his breathing very fast his oxygen levels low. "He is sleeping most the time apart from odd times awake. We knew this was coming but we are heartbroken beyond words." On 1 July, his family posted a picture of Bradley with Defoe who, after signing for Bournemouth, returned to the North East to see him. On Thursday, Defoe broke down in tears during a press conference for his new club and said the six-year-old would "always be in my heart". Bradley became known worldwide following an appeal that saw him receive 250,000 Christmas cards from countries as far away as Australia and New Zealand. In December, he met England manager Gareth Southgate and Match of the Day pundit Gary Lineker at the BBC Sports Personality of the Year event in Birmingham. Bradley then won the programme's December goal of the month award after he took a penalty ahead of Sunderland's game against Chelsea. He has also appeared as a mascot for Everton, who pledged £200,000 to his fundraising campaign, and was visited in hospital by a number of Sunderland players. A dream came true when he appeared as mascot for the England team at Wembley Stadium before a game that saw Defoe score a goal. He was also given honorary 41st place in the race card for the Grand National at Aintree in April. On 30 June a charity single, "Smile For Bradley" by LIV'n'G, entered the singles chart at number 28. All proceeds from the song will go to the Bradley Lowery Foundation, which has been set up in his honour. Bradley was named Child of Courage at the Pride of North East Awards just days before a party was held to celebrate his sixth birthday, which was attended by Defoe and 250 other well-wishers. Fewer than 100 children in the UK are diagnosed each year with neuroblastoma and most living with the condition are under the age of five. Dr Guy Blanchard, chair of Neuroblastoma UK, said: "All in the neuroblastoma community will be saddened to hear the news of Bradley's death. "His story raised significant awareness of a disease that is responsible for one in six of all children's cancer deaths. "Through the world-leading research funded by Neuroblastoma UK, into improving both diagnosis and treatment of the disease, we will find a cure."